What is the Meaning of "A La Carte?" The term “a la carte” translates from French as “by the card”. “According to the menu” seems like a better translation, especially knowing that this term is used to refer to a style of service in restaurants. This type of service enables you to order only the meals that are written on the menu. The main advantage of a la carte style is that you can always know how much it’s going to cost you. The prices on the menu are fixed and the total bill is calculated by adding up the cost of each item that you’ve ordered. Another great thing about a la carte is that it gives you a freedom to choose what you want to eat. You can make any kind of combinations of the items listed on the menu. For example, if you feel like taking seafood for starters and a beef steak as the main dish, no one can stop you! Of course, as long as these items are available on the menu! The two main menu types across the United States are a la carte and buffet. Simply put, with a la carte menu you pay after making the order (and finishing the meal), while in order to get an access to an all-you-can-eat buffet you are usually required to pay in advance. So, which is better: a la carte or all-you-can-eat buffet? If we’re gonna be honest, there’s no real answer to this question – it all depends on your preferences. What’s the best dining style also depends on how hungry you are at the given moment, how much cash you have in your pocket, as well as which kind of restaurant you would like to visit. For instance, if you’re feeling really hungry, a much better option than a la carte restaurant would be an establishment that offers all-you-can-eat deals. 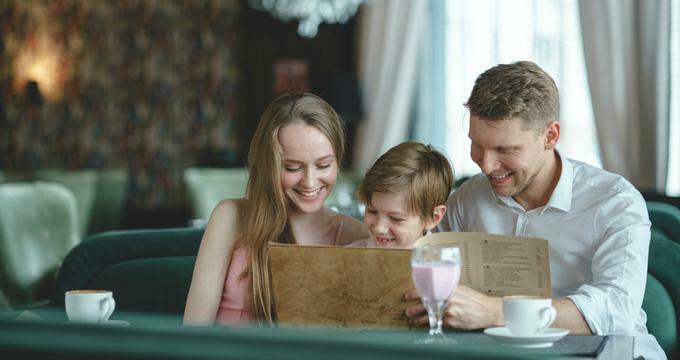 If you prefer multiple courses at family-owned restaurants, you are likely to run into a type of diner that uses the so-called prix fixe menu. What this means is that you will get served a multiple-course meal. But, you won’t be able to choose each individual part of that meal. Instead, you get what’s on the menu that day. If you like to make your own choices rather than letting others pick dishes for you, a la carte is your best dining option. It allows you to pick exactly what you want to eat, starting from the appetizers to the main dish and salad. The chances are that you’ve already encountered most of these serving styles with strange names. In fact, a la carte system is used by a large majority of fancy venues, as well as a fair share of fast-food restaurants. However, some restaurants do offer an all-you-can-eat buffet, usually as a part of a promotion. How it works is that you get to pay a fixed price, but there is no limit to how much you’re allowed to eat. As long as there’s food on the table, you are free to eat it! But, you should know that all-you-can-eat buffet is not the same thing as the prix-fixe menu, although some restaurants use these terms interchangeably. The main difference is that the latter refers to a case in which you pay a fixed price for a single course (or sometimes a multi-course meal), rather than being allowed to everything that’s on the table. It’s a similar case with the establishments that use the prix-fixe menu. These are usually family-run restaurants, which usually have a fairly small number of employees. In turn, this means that they just can’t fulfill all the requirements of every single guest. That is why some of them have decided to go with a simple solution – rather than letting the guests choose from a large menu, they offer one type of meal at a time. Usually, it comes in the form of the “meal of the day”. Basically, the prix-fixe menu seems ideal for those culinary adventurers – you can’t choose the specifics of your meal, instead, you get the combo that the chef thinks is the best. However, this can be a problem for those with special dietary requirements. For example, if you’re allergic to certain types of food, a la carte seems a much better option. That way, you will be able to pick only the meals that are 100% safe for you. On top of that, ordering from a menu lowers the chance that you won’t like the dish. What the Best Dining Option? The answer to this question depends on many different factors, starting with your preferences. If you can eat a lot, you might wanna consider going to a place that offers an all-you-can-eat buffet. However, there’s another factor that you need to take into account – your budget. Surely, if you’re really hungry, buffet seems like the logical choice. However, these deals are usually a pretty expensive choice if you’re not a big eater. In that case, a much better alternative would be a venue that uses a prix-fixe, or even better, an a la carte restaurant. What’s the best option also depends on how hungry you are at the moment. If you can wait for the cook to prepare a meal, then a la carte is perfectly okay. But, if you feel like you need a meal right now, then a buffet or a prix-fixe menu is a better alternative. Finally, it also depends on whether you’re a fine-dine-enthusiast. Typically, high-end restaurants stick to a la carte menus. When you think about it, it’s perfectly logical – all-you-can-eat offers don’t quite go along with fancy venues. However, it is true that some luxury venues where celebrity chefs are in charge of meal preparation also use prix-fixe scheme. After all, you can’t tell Jamie Oliver what to do – he’ll make a meal of his choice and it’s up to you to choose whether to buy it or not.